Want to Help Reduce Textbook Costs for Our Students? Textbooks cost our students more than $1300 per year on average, and according to the Government Accountability Office, textbook costs have increased 83% between 2002 and 2013: three times the rate of inflation! Because many of our students are financially disadvantaged, they often have not purchased textbooks before classes begin. This puts students behind from Day One, decreasing their chances of success. If more faculty chose freely available course materials, students would have to pay less money to earn a degree, and might even perform better in their courses. A large-scale study at the University of Georgia found evidence that college students who are provided with free course materials at the beginning of a class get better academic results than those who are not. The faculty, staff, and students working on Reimagining the First Year (RFY) on our campus would like to provide faculty with the means and resources to use more Open Educational Resources (OER) in their classes. 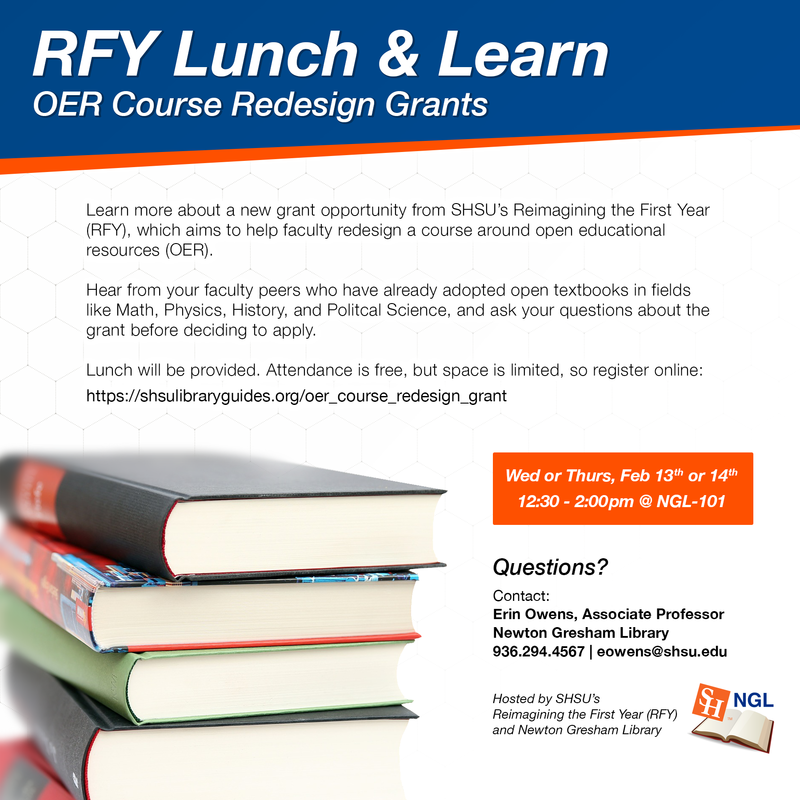 In order to assist faculty with making such a decision, RFY is sponsoring OER Course Redesign Grants to be awarded in Spring 2019 with the goal of implementing redesigned courses by the end of 2020. Assistance from an SHSU Online Instructional Designer for online classes. If possible, to speak at an event for a future cohort of grant applicants. "The OER Adoption Impact Explorer helps you understand some of the impacts of adopting OER instead of commercial textbooks. Change the values...to match data from your institution to see how OER adoption can benefit your students and institution. Charts, graphs, and language will update in real time as you make changes." Lunch will be provided. The events will feature faculty panels of "early adopters" at SHSU, who will share their experiences about making the switch to open textbooks in diverse disciplines such as Math, Physics, History, and Political Science. Attendance is free, but space is limited, so reserve your seat in advance. Attending a Lunch & Learn does not commit a faculty member to apply for the grant. Likewise, attendance at a Lunch & Learn is not required to apply and be considered for a grant. However, information about the submission process will be discussed, and faculty will have the opportunity to ask questions about the grant. Applications have now closed. We look forward to announcing the grant recipients by the end of March! Submit this online application to be considered for the OER Course Redesign Grant. A brief statement of support from your department chair is needed to paste into the online application. All courses at all levels are eligible; the grant is not limited to first-year courses. Eligibility is NOT limited to tenured or tenure-track faculty. All faculty teaching at SHSU are eligible to apply with the support of their department chair. Faculty who already use OER in a course may still apply to redesign a different course. Video: What is the Impact of a Free Book?